Win Your Illegal U-Turn Ticket! While there are many defenses to this charge, the most common is to challenge whether the area you were in was a business district. The government must prove very specific things when proving its case and often times, it falls short. We get these types of tickets dismissed on a regular basis. Call now to find out how we can help you with your ticket. A short conversation with one of our attorneys might save you money, time and DMV points. 877-985-0002. 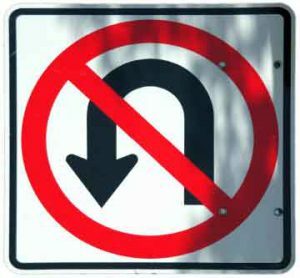 If you are charged with making an Illegal U-turn in a Business District, hire California’s best ticket law firm. We will substantially increase the odds of getting your ticket dismissed, fines reduced, or DMV points avoided. To learn more about our procedures and how we can fight your traffic ticket, call the California Ticket King, PC at 877-985-0002 or email our attorneys at info@caticketking.com.